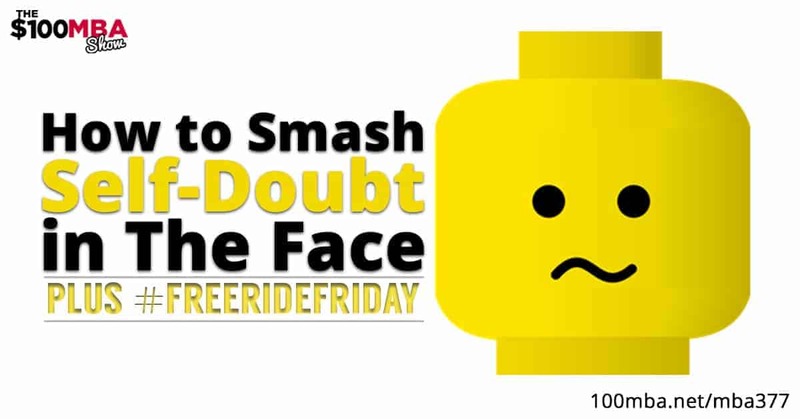 How to Smash Self-Doubt in The Face Plus Free Ride Friday! MBA377 How to Smash Self-Doubt in The Face Plus Free Ride Friday! The number one cause of failure for many entrepreneurs is…self-doubt. How much you believe in yourself plays a huge factor on how successful you are as an entrepreneur. Let us give you our proven strategies to help you smash self-doubt head on when you’re faced with it. Let’s get on with it! Press play! Media Temple For years, Media Temple’s Grid service has been the web hosting choice of more designers, developers, and creative professionals than any other platform. That’s because a single Grid account can host anything from your portfolio site to 100 different client projects. Special discount for $100 MBA listeners, use promo code MBA25 for 25% off web hosting. Go to mediatemple.net and enter your promo code upon signup today! « Previous Post MBA376 Three Tech Skills I Recommend You Learn Next Post » MBA378 Q&A Weekends: How do you manage a daily podcast production schedule? Let’s say 10 min episodes.